I apologize for the submitting this late even though Dr Anil kept sending gentle reminders. I was waiting for the various impressions of the walk, to settle down into a calm river from which I could pick out the sparkling stones that still catch my attention and present them for everybody to read. When I sat down to write this post, I just had to plunge my hand into the icy water and I came up with this stunning blend of stones of various hues – blues, greens, reds, purples, whites, blacks, and beiges. These were the stones which represented each one of the amazing people I met. Dr Bala, Poshini Akka, Vineetha, Dr Anil, Sri Chaman Lal, Venuji, Mamta (she insists I call her that) and all the people from the villages. The enthusiasm, the joy with these which these people carry on their work, the way the sobriquet of social worker sits so lightly on them! and the respect they share is so beautiful. To be honest, I have not heard a patriotic song after my school days. To see people breathing India, talking India, reading books about Indian freedom fighters, meditating on the words of Indian icons, singing patriotic songs with so much fervor, is something that amazed me! Walking around with these people has increased my respect for my country manifold. I now know there is a lot more to this country than I have learnt or thought about and that there are amazing people in this country! I suddenly want to learn all things Indian…and proudly proclaim my Indianness, when before I wouldn’t give it a second thought. I am an Indian was like a fact that generated neither pride nor cynicism. But after walking with these people, the word India has taken on shades. I can no longer be indifferent to it. Some parts of it make me sad, some immensely proud, but indifference nope, not anymore. I get scared that over time, I would (re)turn to indifference, but I know I just have to look at the colors of these stones and I would see that indifference is not possible. The second impression that’s stuck with me like a starfish is the urban rural divide. Whenever we passed through villages, people would give us time. Once they realized that we are helping them out, they would open up. However, when we reached Bangalore, it was an all together different story. I was genuinely baffled by the leers, the lack of respect (was it only for women? I am not sure) and the way the people sneered at our good intentions. Maybe we were not reaching out to the people in the city in the way that touches them. Maybe they required something to jolt them out of their apathy. All these explanations came to my mind later when I had time to think about it. At that point of time while walking through Banashankari, there was just this tiredness. I did not want to talk to people in Bangalore, though I am a Bangalorean myself. But as Dr Bala had told us, we needed to be like the ‘karmayogi’ of the Gita — a person who believes in doing his duty, leaving the rest to God. That one statement did help a lot especially when people would tell us on our face that they don’t care. The Kannada divide also was very apparent or should I use appalling? Very few people in Bangalore admitted to knowing Kannada. It was in a way good for me, because I felt I could use my strengths in getting the message across. But other team members felt left out. I unwittingly contrasted the villages and the city again. 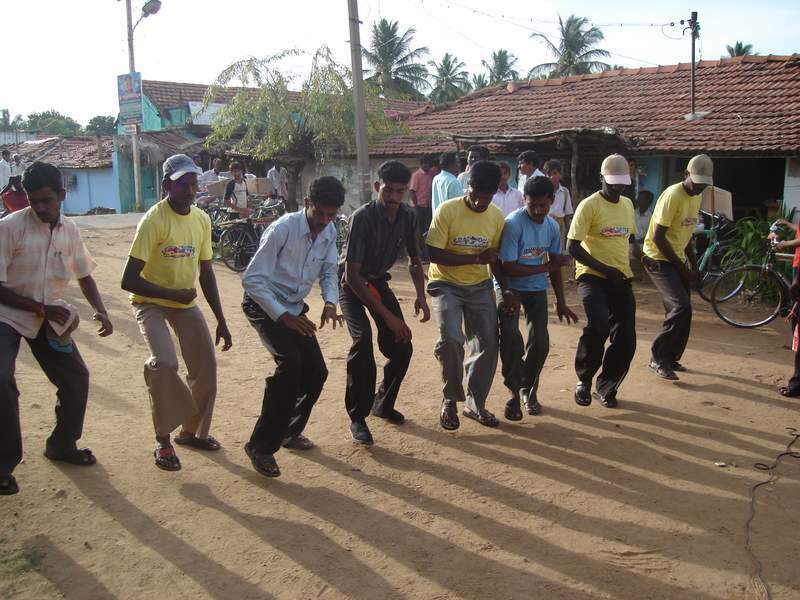 When I went to a village, people helped me out, I did not feel inferior because I did not know Kannada…just different. People made sure I learnt and were patient enough to teach me. I must thank them all. Dhanyavadagalu! However in Bangalore, if you don’t know English, you are made to feel inferior. Bangalore is a place in Karnataka and a Kannadiga feeling lost in Bangalore saddens me. I truly believe that language moulds the tone of a conversation and talking to a person in his own language makes you more empathetic towards that person. I know I was horrible…i can cite innumerable instances to that effect! But I intend to be better. The moment of realization about my Kannada came was when I was talking to Shobha and asking her about what she expects in the future. She very earnestly told me her entire past. It confused me a lot because Jagruthi Yathre came at the end of sequence, and I thought maybe there’s another one coming up in the near future and that Shobha has already planned for it. When I talked to Poshini akka and Vineeta about it, they were doubling over with laughter! The underlying motive of the walk, the underlying current of the river – that is spreading awareness about the right to information act is not lost to me. I was as interested as the people in villages in knowing details. I saw the play, I heard the songs and listened to the various success stories. I talked to whoever was talking about it during the walk and I now know how powerful an act it is. I have started researching more about it to know its technical details. However it is still not real enough for me because I have not done it myself. I am convinced about one thing though, i.e, if there are so many articulate and compassionate people who believe in it and tell me it is easy, there has to be something about it. Which is why I intend to file a few applications myself and am hoping ardently that I don’t get discouraged. Anyway, I am glad I came for this and I really wish I had come earlier. As everybody told me during the walk, the response in the further off villages was more heartening and I would have loved to see it. After the 6 day walk, I am suffering from Mahiti Kayile (I hope I said that right) and withdrawal symptoms 🙂 I still pine for the sense of shared cause, for the sincerity of intention, for the wonderful joy, for the forcefulness of their personalities and the simple and amazing food. I am hoping it keeps bringing me back from day to day life.